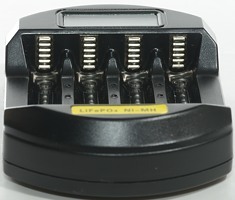 This charger is for 3.2V LiIon and NiMH batteries in AA and AAA format. 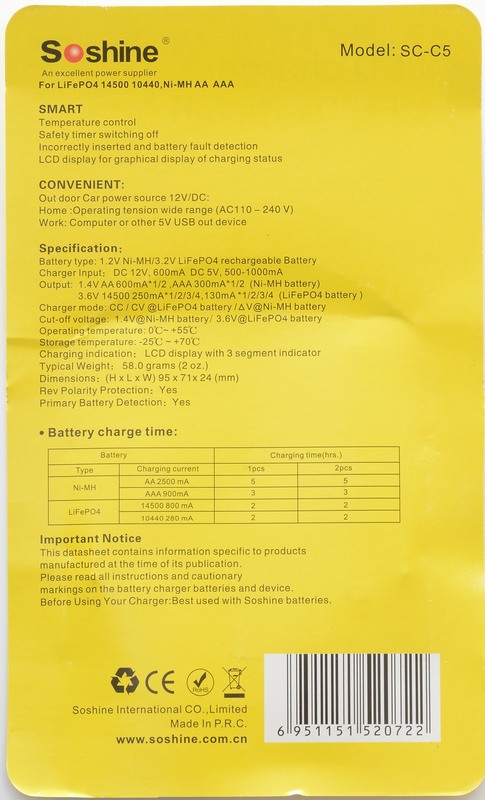 I got the charger in a small blister pack with the specifications printed on the inlay. 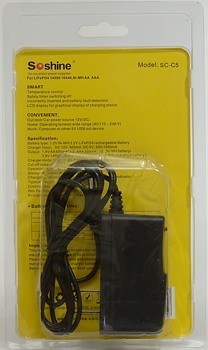 The box contains the charger, and a power supply. 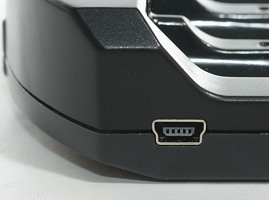 The charger has a barrel connector (2.1/5.5mm) and a mini usb connector for power input, the supplied power supply delivers 12V. There is not much user interface on the charger. 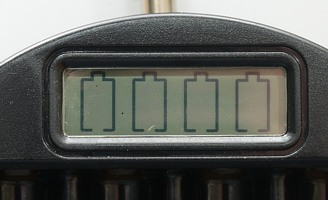 The LCD display is animated when charging and shows filled symbols when the batteries are full. 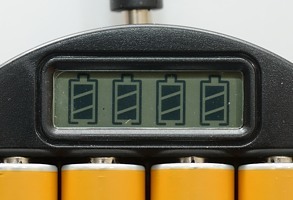 Without batteries in the charger the symbols are empty. There is a nice green background light that makes it easy to see the symbols in darker conditions. 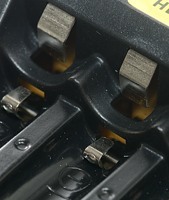 The charger uses two level slots for AA and AAA cells. 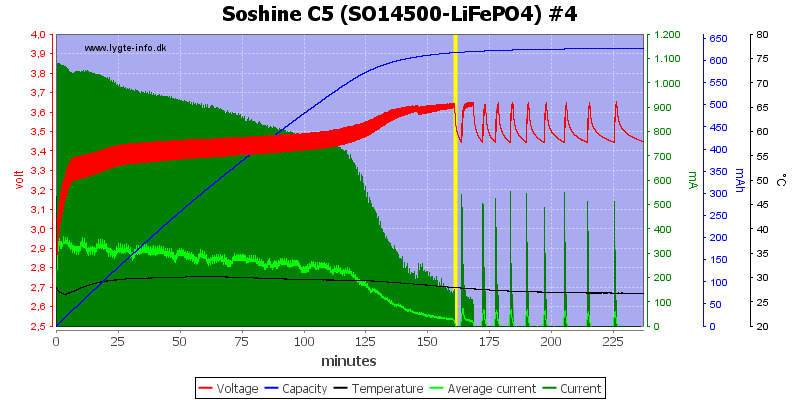 With power off it will discharge batteries with less than 1uA. 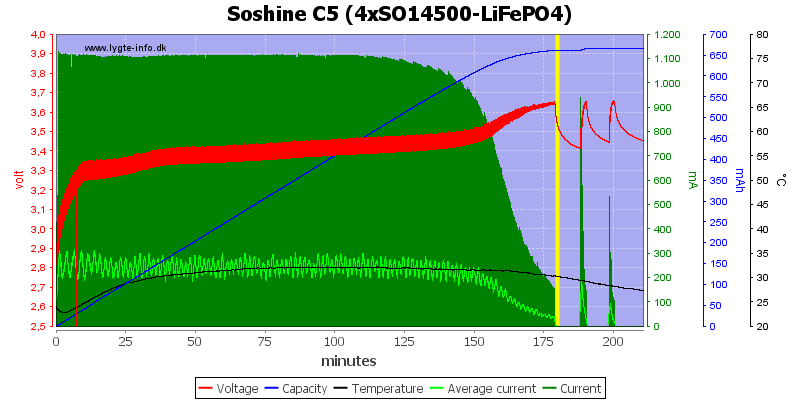 It will restart LiFePO4 charging when voltage drops to about 3.45 volt. 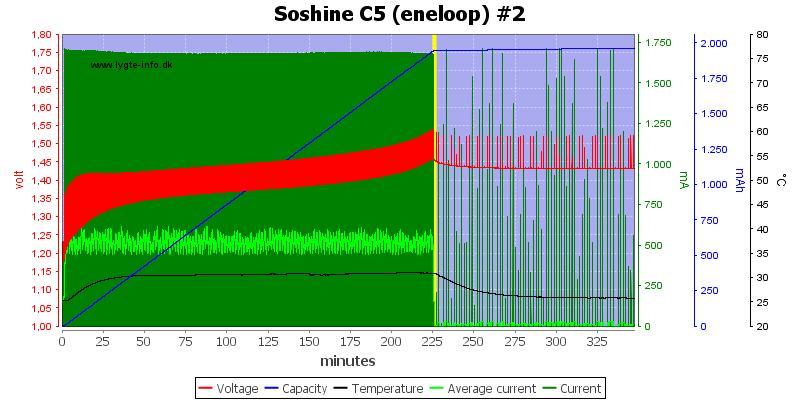 It will restart charging is cells are reinserted or power is cycled. 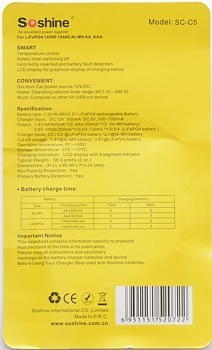 Charger will apply current from 0 volt and will go into fail mode if voltage stays low. 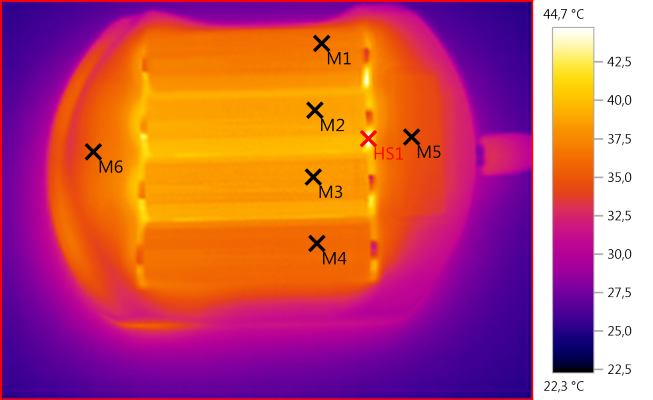 The charger terminates on voltage, it looks like the battery is nearly full, but not enough to increase temperature. 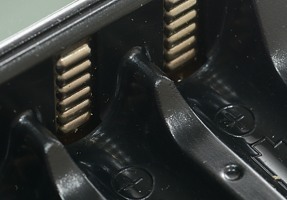 When finished the charger will switch to a fairly low trickle charging. The 3 other channels looks the same, again no temperature increase. This cell is getting old, as can be seen on the thick read line (This means high internal resistance) and it is not filled. The powerex is filled more (See mAh scale), but still not full. 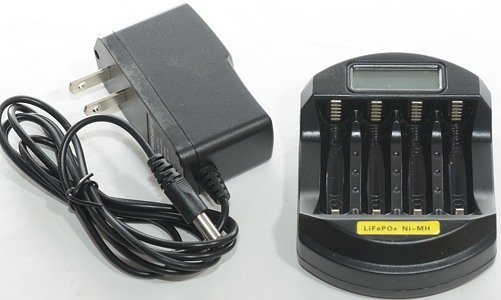 The charger current is lower with AAA cells and the cell is nearly full according to the mAh scale, but it has not increased temperature. Starting with a full eneloop the charger needs some time to detect it and this time the cell do heat up. 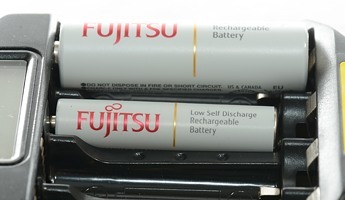 With four batteries the charge current is lower and the temperature is higher. 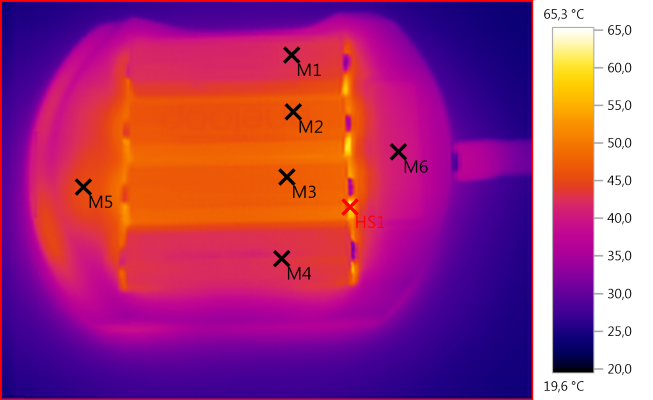 The charger uses only about 500mA on 12 volt and it looks like a small temperature raise, i.e. the cell was filled. 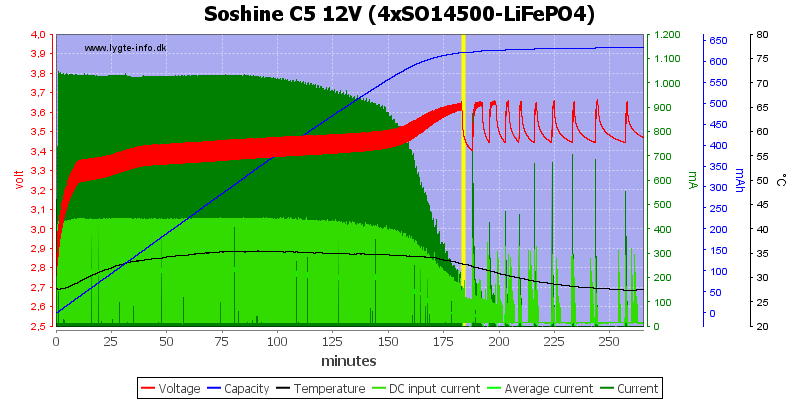 There is not much different between using 5V or 12V supply, except it draws more current from a 5V supply. The temperature is a bit on the high side on the two center cells. 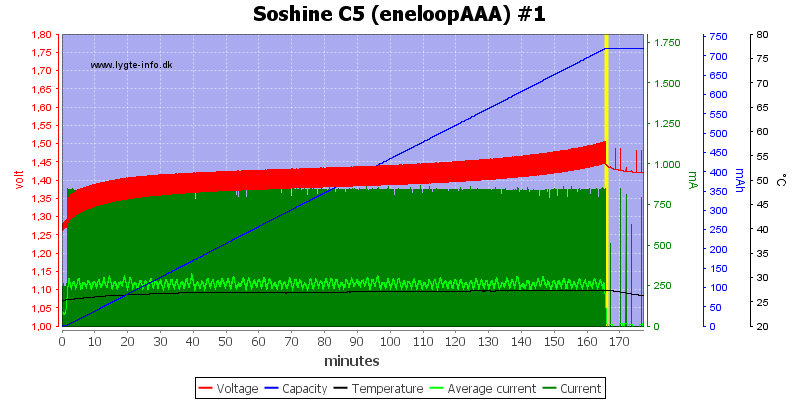 The charger needs abut 3 seconds to initialize and uses a pulsing charge. 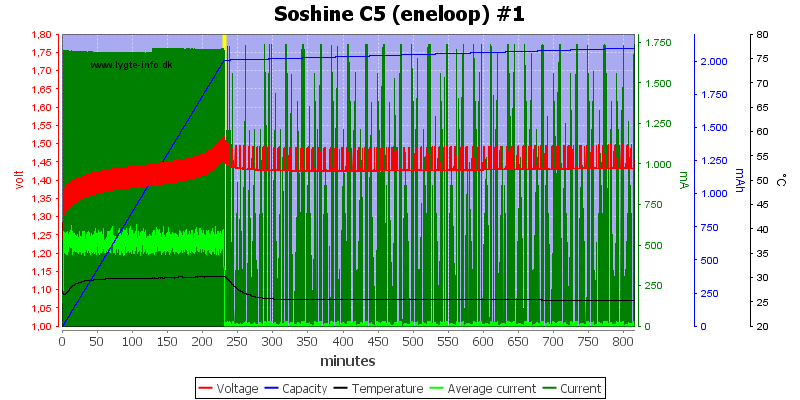 Not being able to see when charger switches into full current, I did one more power on with slower timescale. The first 1½ minutes of charging is at low current, then it increases to full current. Same for AAA cells. 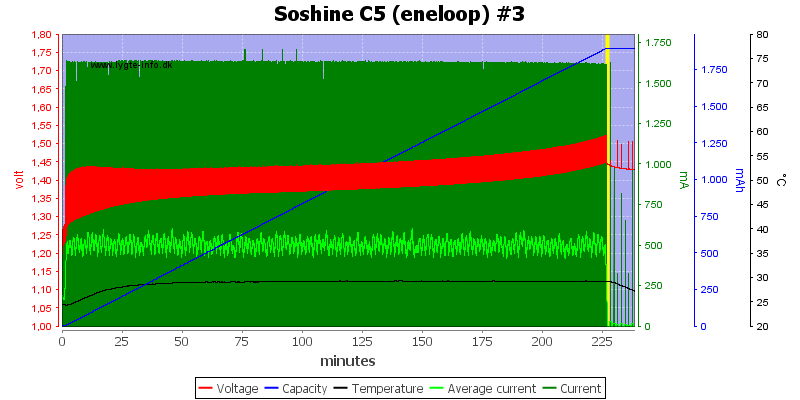 The charge current is lower in this case. 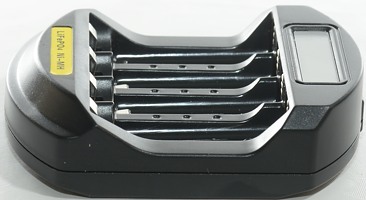 This is done because the charger only has one charge circuit and it is switches between the four batteries in the charger. 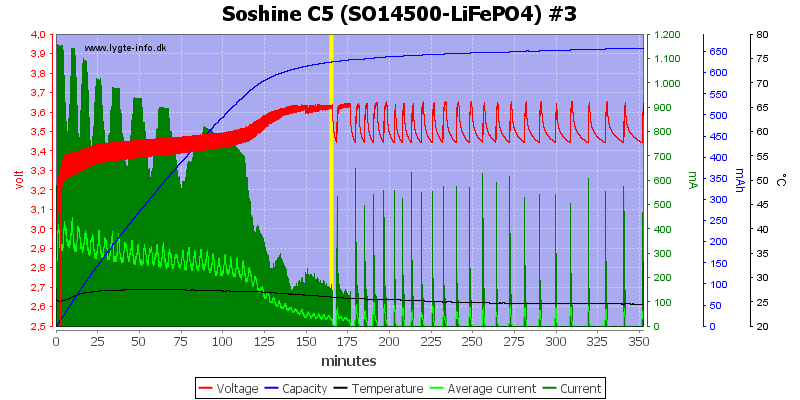 The trickle charge is pulses at full current each 1½ minute. 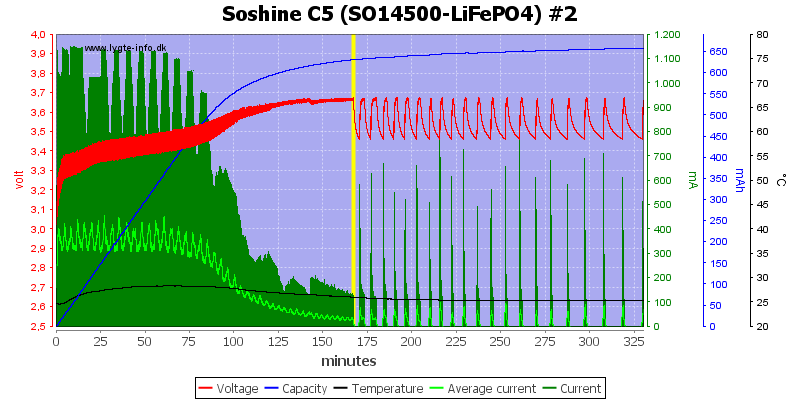 Here is a zoomed look at the pulse, calculating on this gives a trickle charge of 8mA. 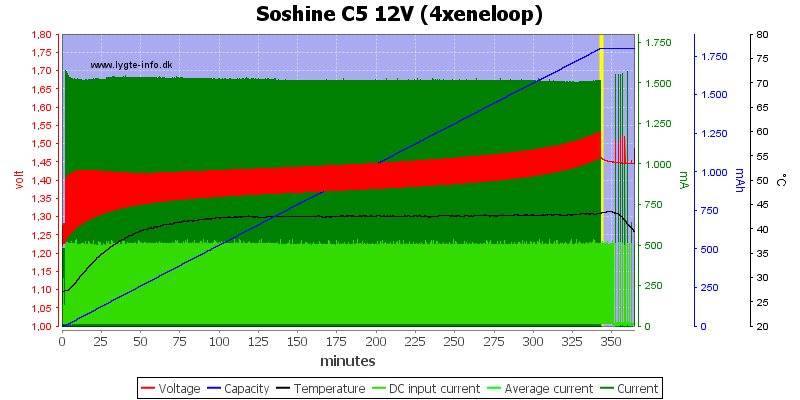 The charge curve is a CC/CV charge, but the charge does not terminate correctly, they restart voltage is to high and it will turn current off/on many times. The other slots works the same way. 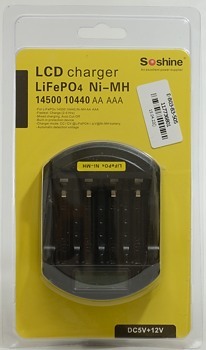 Another brand of LiFePo4 cell. The voltage is slower to drop, but it will restart charging. 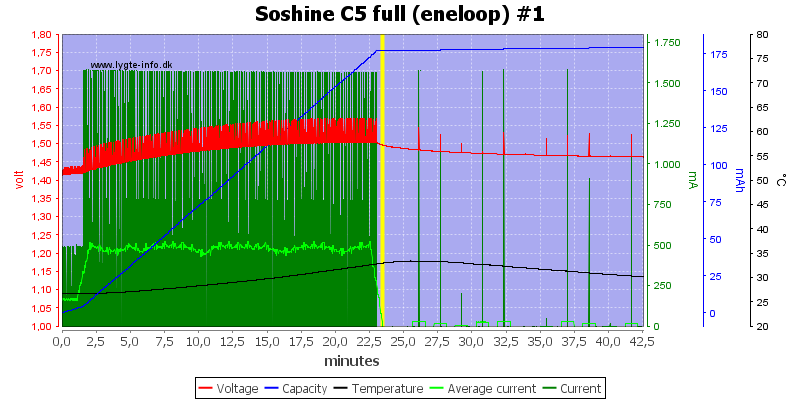 The charge speed is a bit slower 4 cells. And it needs about 0.4A from the power supply. 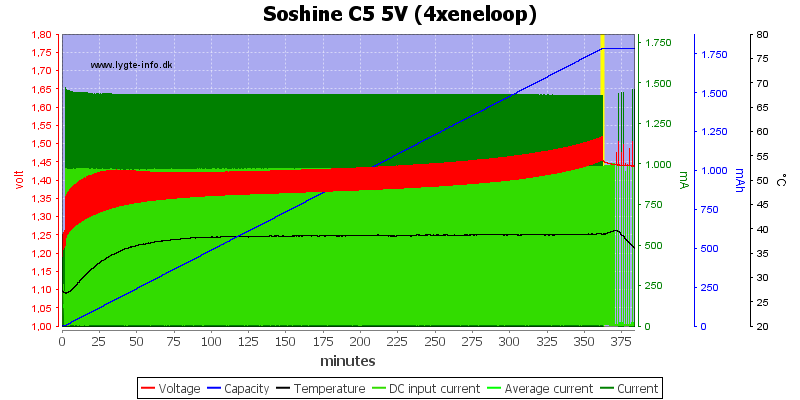 With 5 volt supply it needs more current. 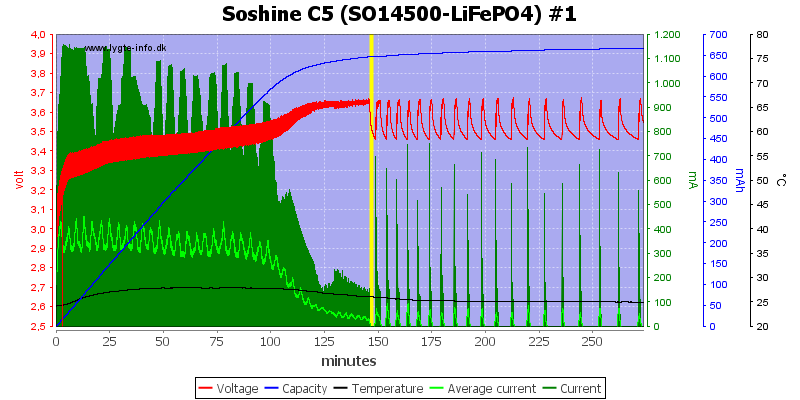 The temperature is lower when charging LiFePO4 cells, than on NiMH cells. 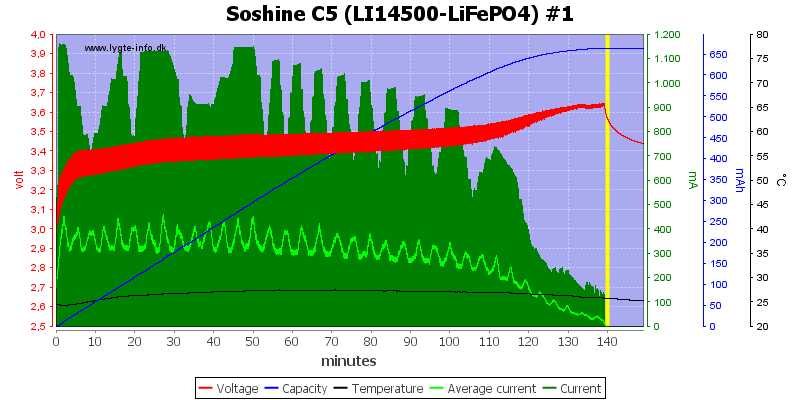 The LiFePO4 works the same way as NiMH, but with higher voltage. 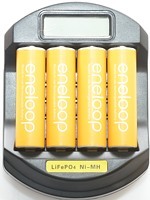 The charger has no problem charging a mix of LiFePO4 and eneloops. 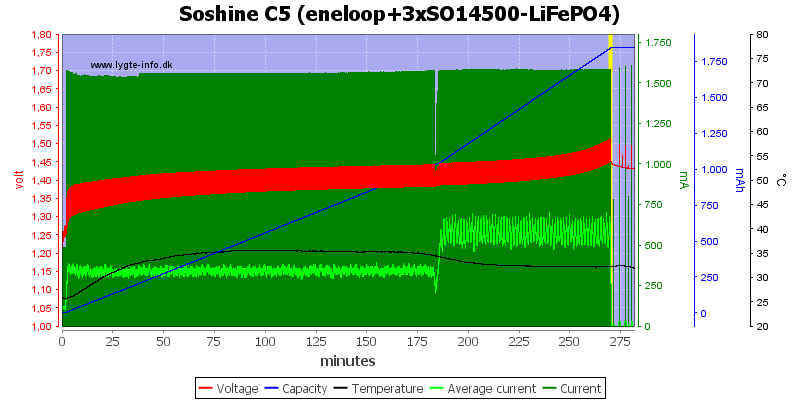 Here the 3 LiFePO4 finish first and the current is increased to the eneloops. 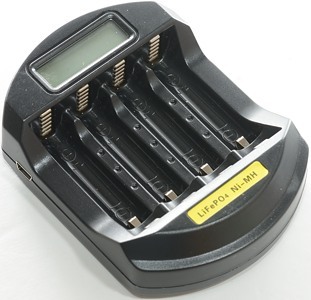 Here I measure on the LiFePO4 cell. 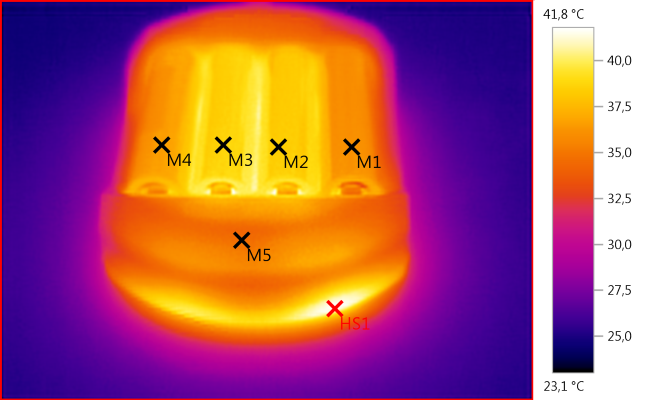 Testing the mains power supply with 2500 volt and 5000 volt between mains and low volt side, did not show any safety problems. The charger will charge, but I am not impressed with how it does it. 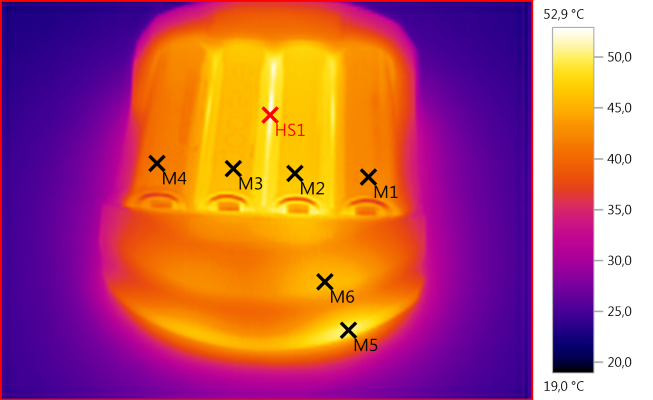 NiMH is acceptable, but because it is a compact charger the cells get warm. 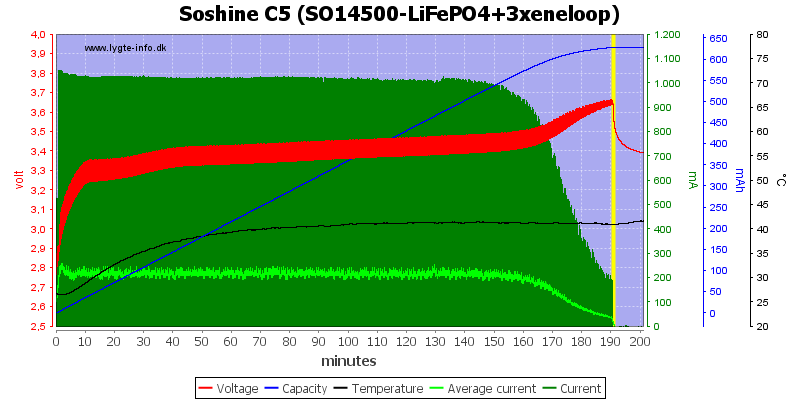 With LiFePO4 the restart level is placed at too high voltage. 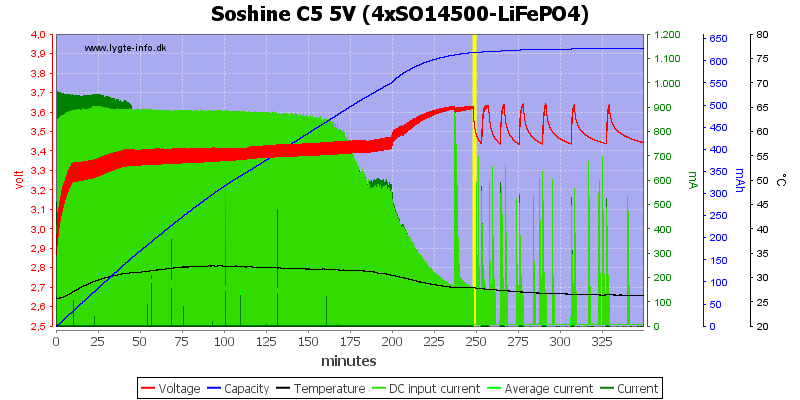 It is best to keep an eye on the charger and remove the cells when it reports done. Charts without any voltage noted was done with the supplied 12V power supply.